Baruch Spinoza was one of the great philosophers of the age of Rationalism and a major influence thereafter, as on, paradoxically, both of the bitter enemies Arthur Schopenhauer and G.W.F. Hegel. From a Portuguese Jewish family that had fled to the relative tolerance of the Netherlands, one of the most famous things about Spinoza was his expulsion from the Dutch Jewish community. This is often called an "excommunication," though, as I used to have a high school teacher protest, there is really no such thing as "excommunication" in Judaism. Nevertheless, Spinoza was expelled from the Jewish community and anathematized. Although he is today recognized as one of the greatest Jewish philosophers ever, and the chief Rabbis of Israel have been petitioned to formally lift the curse upon him, this has not happened: Spinoza remains a controversial person in Judaism, for very much the same reasons that led to his expulsion in the first place. Spinoza's God is not the God of Abraham and Isaac, not a personal God at all, and his system provides no reason for the revelatory status of the Bible or the practice of Judaism, or of any religion, for that matter. Spinoza's alienation from his community is reflected in an alternative version of his name. "Baruch" in Hebrew, (bârûkh), means "Blessed"; but Spinoza began using the name "Benedict," which in Latin (Benedictus), would mean "spoken well of" or "praised." This reflects the circumstance that Spinoza, with whom Jews were forbidden to associate, inevitably found friendship with Christians instead. Nor was he unsympathetic with Christianity. However, there never was any chance of Spinoza adhering to Christianity as a religion anymore than Judaism. Spinoza's sympathy for Christianity, like Thomas Jefferson's, was entirely for the moral teachings of Jesus, not for the theology, Christology, or the promise of the means of salvation. Like Jefferson, again, Spinoza was a kind of Unitarian, for whom the purely religious aspects of the religions were nearly meaningless. Although his major works went unpublished in his lifetime, Spinoza did acquire concerned friends and some measure of favorable reputation. He had made a living for a while by grinding lenses, where the dust had damaged his lungs. The pension that his friends later obtained for him thus did not prevent him from dying at a tragically young age of 45. His chance for an established academic career, with an offer from a German university, was rejected, naturally, because of the confessional conformity that would have been required. Spinoza's life, consequently, though not irredeemably horrible, seems on the whole sad, isolated, and blighted. 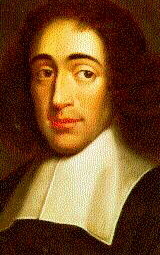 Besides tragedy, Spinoza's life and thought is most noteworthy for paradox. No one would ever have thought to call Thomas Jefferson "the God intoxicated man"; but although honoring, apparently, the same sort of rationalized, secularized, and impersonal Deity, this is precisely what Spinoza has been called. How does one, indeed, become "intoxicated" with such a God? Since Spinoza explicitly identifies his God with Nature, it doesn't even seem to be a God at all. How about "the Nature intoxicated man"? Spinoza today is often cited by people who advocate a reductionistic scientism but who are willing to retain some traditional terminology, so that the term "God" adds nothing to the very same natural world described by science. This overlooks a great deal of Spinoza's metaphysics, but the real challenge is how Spinoza's God, even properly conceived, would provide any of the solace, comfort, and meaning of traditional religion to someone like Spinoza. Exactly what was the emotional pull of Spinoza's God on him? We find the answer to this question in the realization that Spinoza is not entirely a modern thinker and that his God in fact has antecedents in the Middle Ages. It is too easy to get carried away with the evident conformity of Spinoza's system to the requirements of science and overlook the foot that it still has planted firmly in Mediaeval Jewish mysticism. Mediaeval Jewish philosophy, in fact, was closely allied to the Neoplatonic philosophical tradition of Late Antiquity, as this had been taken up and developed during the intellectual flowering of Islâm in the 9th century. The details of Spinoza's metaphysics, ironically but significantly, share much more with Islâmic theology than with that of either Judaism or Christianity. It is not clear that Spinoza was even aware of this (or that "Benedict" would be a better translation of Muh.ammad, , "Praised," than of "Baruch"), but it could even be said to be the result of a similar emphasis on the uniqueness and power of God. Mediaeval Jewish philosophy reached its height in Spain with Moses Maimonides (1135-1204) and Moses Nahmanides (1194-1270), as Mediaeval Jewish mysticism reached its height with the Zohar of the Spanish Jew Moses ben Shem Tov. Although more rationalistic than Nahmanides, Maimonides, one of the greatest philosophers of the Middle Ages, was nevertheless in the Neoplatonic tradition that had originally mixed both considerable rationalism and mysticism, i.e. the belief in the possibility of personal knowledge, even union, with God and the notion that "religious" truths are often really rational truths packaged in a way comprehensible to the masses. Such views are the most plainly and accessibly stated in Lenn Goodman's translation of the book of the Spanish Islâmic philosopher Ibn Tufayl, Hayy Ibn Yaqzan. Islâmic philosophers eventually got in trouble for such ideas. Jewish philosophers were less likely to get in trouble with the authorities, until, that is, Spinoza. We can gather how this works in Spinoza by examining the details of his metaphysics, as found in Book I of his postumously published Ethics. The fundamental thing to keep in mind when thinking about Spinoza is one simple, striking, and paradoxical proposition: God is the only thing that exists. Although a relatively unfamiliar notion in Western philosophy and religion, which may be why it is frequently forgotten by people carelessly invoking Spinoza for their own purposes, this is a venerable position in India, and Spinoza's theory can be classified as a version of "qualified Advaita Vedânta," where everything that we ordinarily think of as existing, does exist as a part of God. It is also noteworthy that the Jewish-Islâmic Mediaeval mystical tradition also approached this. L.H. Grunebaum says of the Sufis, the Islamic mystics, "The mere attribution of reality to any entity besides the One is polytheism" [Medieval Islam, University of Chicago, 1946, 1969, p. 133]. In terms of modern philosophy, we have the term "pantheism," that God is everything; but this can convey the wrong idea. It is not that God is everything, as though everything exists individually and is somehow God, but that nothing exists independently except God and that the "everything" we ordinarily think of is a feature of God. Another term occasionally used for Spinoza is "panentheism," that God is "in" everything; but this is even more deceptive, since it makes it seem like God is a feature of things, rather than the other way around. The way that Spinoza argues it is that there is only one substance, and then that there is only one individual of that substance. In the tradition of Anselm and Descartes, God is a "Necessary Being," who cannot possibly not exist. Existence is part of his essence, and he cannot be without it. But existence is not the entire essence of God. Instead, the one substance is characterized by an infinite number of attributes. Besides existence, we are only aware of two of these: thought and extension. Thus, where Descartes had seen thought as the unique essence of the substance soul, and extension as the unique essence of the substance matter, Spinoza abolished this dualism, and the paradoxes it generated. Thought and extension are just two, out of an infinite number of, facets of Being. A reductionistic scientism that wants to claim Spinoza as one of its own typically overlooks this aspect of the theory: Spinoza's God thinks, and also is or does many other things that are beyond our reckoning and comprehension. Thus, although Spinoza was condemned by his community for the heresy of saying that God has a body (denying the transcendence of God common to Judaism, Christianity, and Islâm), God is nevertheless much more, indeed infinitely more, than a body. As God is eternal and infinite, so are his attributes eternal and infinite. The things we see that are transient and finite are the temporary modifications, or "modes," of the attributes. This gives us the same relationship between things and the attributes as Descartes had between individual bodies and thoughts and their substances. A material thing is a piece of space itself (space is not the vacuum, but actually matter), the way an individual wave is identifiable in the ocean but does not exist apart from the water that it consists of. In the same way a specific thought is a temporary disturbance of the attribute (like the Cartesian substance) of thought -- or, we might say, of consciousness. The wave metaphor is apt: Our existence is a ripple on the surface of God. The structure of substance, attribute, and mode is the foundation of Spinoza's metaphysics. But there is another distinction that cuts across this, the difference between natura naturans and natura naturata. Natura is simply the Latin word "nature," and what Spinoza has done is add participle endings to that noun. Naturans is thus "nature" plus the active participle ending, which is "-ing" in English; so "Natura Naturans" is "Nature Naturing." Naturata is "nature" plus the past passive participle ending, which is "-ed" in English; so "Natura Naturata" is "Nature Natured." This gives us a contrast between what is creating and what is created. What is creating is the eternal existence and nature of God. What is created are the modifications that we see around us as transient things. This distinction cuts across the nature of the attributes themselves, since there is an eternal and unchanging aspect to each, i.e. space itself or consciousness itself, and a transient and changing aspect, i.e material objects in space or specific thoughts in consciousness. At the same time, there is nothing changing about substance as such or unchanging about the modes as such. While for Spinoza all is God and all is Nature, the active/passive dualism enables us to restore, if we wish, something more like the traditional terms. Natura Naturans is the most God-like side of God, eternal, unchanging, and invisible, while Natura Naturata is the most Nature-like side of God, transient, changing, and visible. When Buddhism says that there is no God, it means that there is no substantive, eternal, unchanging, invisible, and creative side to reality. One of Spinoza's principal metaphysical categories, substance, is explicitly rejected by Buddhism. This is revealing, since it shows us how much there is to Spinoza's metaphysics and Spinoza's conception of God that would not have to be accepted, whether we are comparing it with Buddhism or, more importantly, with a reductionistic scientism. How does Natura Naturans do the creating? By necessity, the necessity of God's own nature. Spinoza's God does not make choices, does not really have a will -- which would imply deliberation or alternatives. Spinoza's God is perfect, which means everything is as it must be and cannot be otherwise. God's eternal nature necessitates the things that happen, which happen just as they must and cannot happen otherwise. This all follows from the premise of God's perfection. It is deterministic. Chance or randomness would be an imperfection. Since only God exists, it is also true that God causes everything to happen that does happen. This is the "Occasionalism" developed by the Cartesian Nicolas Malebranche (1638-1715), that the only cause of anything is God himself; but determinism and occasionalism are also characteristic of Islâmic theology, especially that of al-'Ash'arî (873-935) and of the philosopher al-Ghazâlî (1059-1111). This is Spinoza at his most Islâmic. However, Spinoza goes a bit further. His God does nothing for any purpose. There are no ends or "final causes" in Spinoza. It would be an insult to God's perfection to imagine that he does things to bring about some end, which would mean to make things better or to bring into existence something that doesn't exist already but should. Things are already perfect, and everything that will ever exist already exists, since God (we recall) is the only thing that exists. The purpose of mystical rapture is often not just to see God or know God directly, but to become one with God through complete loss of self. This is what we often see in Islâmic mysticism, Sûfism, but also in India, where the self can ultimately be identical (advaita, "non-dual") with Brahman. In Spinoza, indeed, there is no independent substantial self. The Qur'ân says that God is as close to us as the jugular vein, but Spinoza goes rather further than this. Everything that we are is just a modification of an attribute of God, just a small and transient part of the existence of God. We are absolutely nothing apart from God. This gives a considerably stronger impression that we might think from the notion of the "intellectual love of God" that Spinoza is often said to recommend. To really feel an absolute absorption into God and abolition of self (fanâ', "extinction" in Arabic) would be a mystical rapture indeed. This may be the key to the emotional pull of Spinoza's theory for him: It would be a consolation of religion indeed for him to lose all sense that his life, circumstances, and misfortunes are of more than the most trivial consequence. Sub specie aeternitatis, from the viewpoint of eternity, nothing imperfect ever happens, and we can imagine Spinoza transported right out of his own rather sad and solitary existence into the comforting companionship of God. This is the key to Spinoza's paradoxical and even disturbing view that things like right and wrong, good and evil, do not exist for God. Things only appear right or wrong, good or evil, to a self, and the self does not have substantial existence. Spinoza rather heatedly disputes the relevance of this to God, in whom all is perfect. It is only our selfishness that generates these dichotomies. However, we also might say that it is selfishness that results in wrongs and evils as matters of action, since people do bad things expecting some personal benefit from them. It would not occur to someone without sense of self to be harming others for personal gain. This is an area where Spinoza is appealing to Schopenhauer, who sees selflessness as the motive for good and noble action, and who sees the denial of self as the basis of all holiness and emancipation from the Will. But where Schopenhauer would see holy selflessness as freedom from the thing-in-itself as Will, Spinoza would see it as freeing us from the transient and the individual to become one with God. Where Schopenhauer, a determinist also, saw the denial of the Will as the only truly free action available to us, the corresponding free action for Spinoza, as we might interpret him, would be to turn towards God. While a deterministic Natura Naturata would be a world safe for science, it should now be clear that Spinoza's doctrine allows for the solace of religion by a mystical turn towards something that is invisible to science, the eternal and unchanging Natura Naturans, the infinite essence and existence of God. This is more than enough to enable us to understand Spinoza as the "God intoxicated man," whose convictions got him through the trauma of rejection by his own people and a brief life when it was not even safe to openly publish his views. This all qualifies him, in Schopenhauer's terms, as a Saint -- someone who is no longer troubled by the misfortunes and ordinary expectations of life. It also enables us to see Spinoza in his proper place in the history of Judaism, in the mystical tradition so characteristic of the Middle Ages, but sharing rather more with Islâm and Neoplatonism than with Biblical based Judaism or Christianity.